As always, please refer to the server deployment thread on the forums for the latest updates and information. On Tuesday August 26th, the Main channel was updated with the server maintenance release previously deployed to all three RC channels in week 34, which contains a single crash fix. A “re-fix” for BUG-6466 – “Numbers expressed in scientific notation and include a plus sign in the exponent are not parsed as JSON numbers by LSL”, which was thought to have been fixed a while ago, but which in fact resulted in BUG-6657 – “Valid JSON numbers like 0e0 no longer valid after 14.06.26.291532”, prompting the original fix to be rolled back. STORM-2038 On the Edit tab of the build menu, clicking the area in between the Full Bright check box and the materials drop down box opens the color picker. STORM-2076 Width spinner is broken in the Snapshot->Save to disk floater. The new snapshot floater provides an enlarged preview panel, plus buttons to access the Facebook, Twitter and Flickr upload floaters. 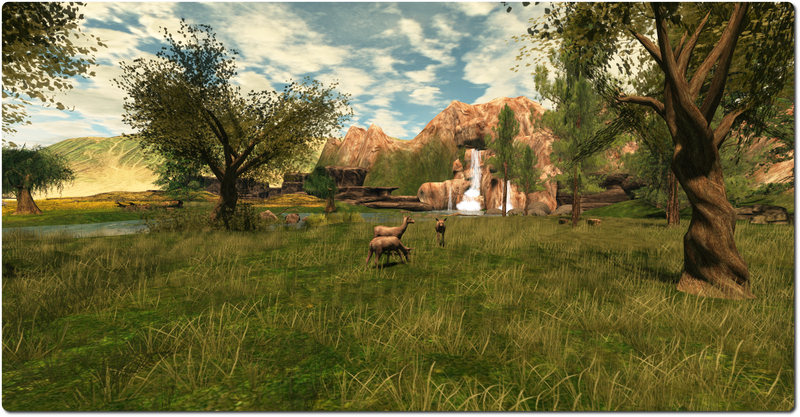 However, what’s possibly going to be very popular among SL users is the ability to use the filter options with snapshots saved to inventory, disk or to e-mail – and the ability to use them on snapshots to be uploaded to the SL profile feed. Further information on the floater can be found in my preview article about it. While there have been no changes to either the Experience Keys project viewer or the Oculus Rift project viewer, an update to the Experience Keys viewer is also anticipated soon. Testing is continuing on the Aditi set-up to test the initial configuration of the proposed texture and mesh fetching CDN, and results are seemingly positive.As noted in my last reports, if successful, this approach will see texture and mesh fetching bypass the simulator entirely, being routed instead directly between the viewer and asset servers via the CDN, which should see improvements in the speed and reliability of such transfers. Given the CDN nodes are located around the globe, they offer significantly faster response times than trying to reach the SL servers. For example: ping times to the SL servers from the East coast US or the UK can be measured at an average of around 110ms or 180 ms respectively; ping times to a local CDN however, have been reported at 10ms and 30 ms respectively. The way the system works means that when a new asset (with a new ID) is created, it is initially held by the Lab’s servers. However, the first time the asset is called, it is delivered to the CDN nearest to the person calling it, and cached there, and once cached, is then served locally whenever called by anyone connecting to that CDN, thus making for faster delivery to the viewer. However, a couple of points need to be remembered when looking at these figures. Firstly, the work is still in its infancy, and there is a way to go before the Lab is in a position to announce anything is ready for prime-time use. 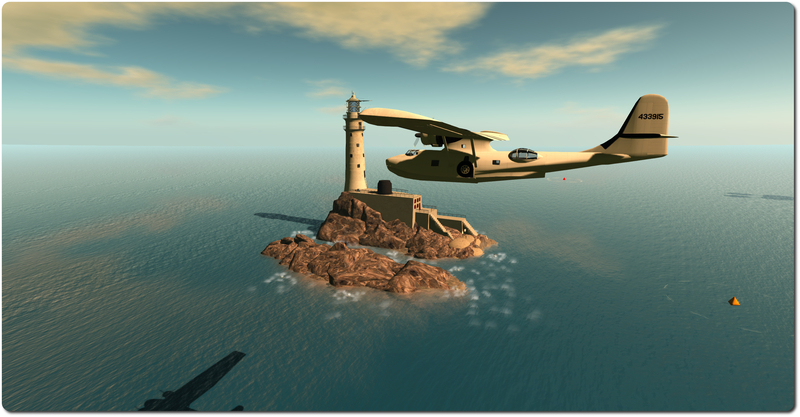 The test environment, while producing valid figures, isn’t something that will scale particularly well, a fact which caused Oz Linden to comment at the Simulator User Group meeting that while the Lab does have a plan for building a scalable solution, hasn’t as yet actually been built. 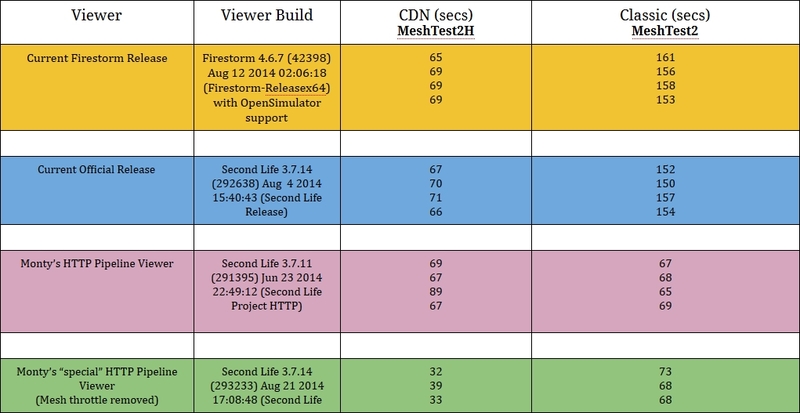 An additional point worth noting is that while the test environment doesn’t require a special viewer (any viewer will work in the test regions on Aditi), any solution which will eventually be deployed will require viewer-side updates. To ensure that all viewers can leverage the new system as quickly as possible when both it and the viewer changes are ready, the Lab plans to release the viewer updates separately from everything else so that TPVs can quikcly merge them into their own viewers. Even so, the Lab welcomes people testing the new set-up, as it helps them to gather more data. Details on the testing and the Aditi regions can be found in the Server Beta meeting agenda notes. Not strictly an SL project update, but something related to SL project work. Loki Eliot has posted a couple of blog posts related to Experience Keys / Tools. In the first, he provides notice that his Escapades Island has now been updated to use Experience Keys – which should make for some interesting fun! In the second, he provides some feedback on his dabbling with Experience Keys, highlighting one or two shortfalls which, while not devastating to the system, do point at least one area where the Lab might want to consider extending the permissions system (seating avatars, which might need a little careful thought), and on how things might be improved on the Oculus Rift side of things for those wanting a really immersive experience with Exp Keys. As I’ve recently posted, in June I donated my Fallingater build on Kitely to the folk at Seanchai Library to become a part of their new home world on that grid, and I’ve been working to overhaul and upgrade it since then. The work on the place is now more-or-less complete, with just a few nips and tucks remaining, and the folk at Seanchai are now ready to open the doors to Fallingwater’s first official engagement as a storytelling venue. Individuals rewriting their own pasts. Brave souls safeguarding the world today from yesterday. Fools tampering with Einstein’s laws of physics. Stories exploring the wonders and perils of time travel, and humanity at its best and worst. 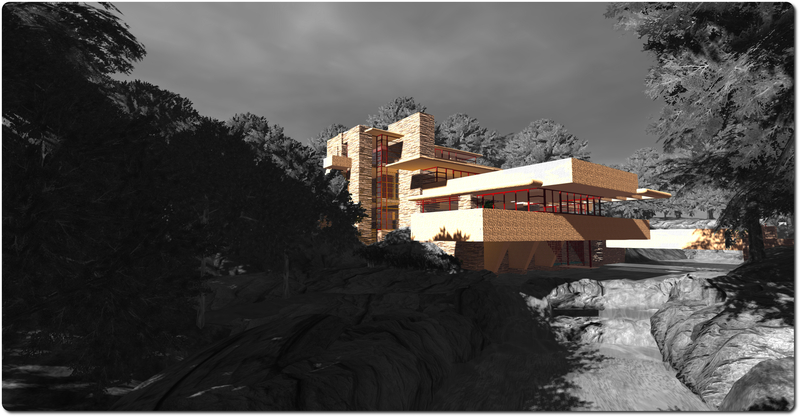 Anyone with an interest in storytelling in voice, and all the traditions which stand therein, and / or who wish to hear engrossing tales from Second Life’s and Kitely’s premier group of storytellers, are welcome to drop by the Seanchai Library’s Kitely home world and Fallingwater. Catching a Cat – but not by its tail! As regular readers here will know, I’ve been bitten by the SL flying bug. It’s not something I do all the time, but it is something I enjoy; so much so that I’ve gained a (very) modest collection of aircraft over the past couple of years, of which I tend to use my EC-135 helicopter, Spitfire and Terra Stingray the most. However, these three now have a competitor for my time and attention: a Consolidated PBY Catalina, which is affectionately referred to as the “Cat” by aviation enthusiasts. It’s one of those aircraft I fell in love with while going around airshows; being a flying boat, there is something very graceful about its lines that not even the frog-like “blister” canopies on the sides or the gawky, sticky-outy main wheels (on the amphibious version) can spoil. 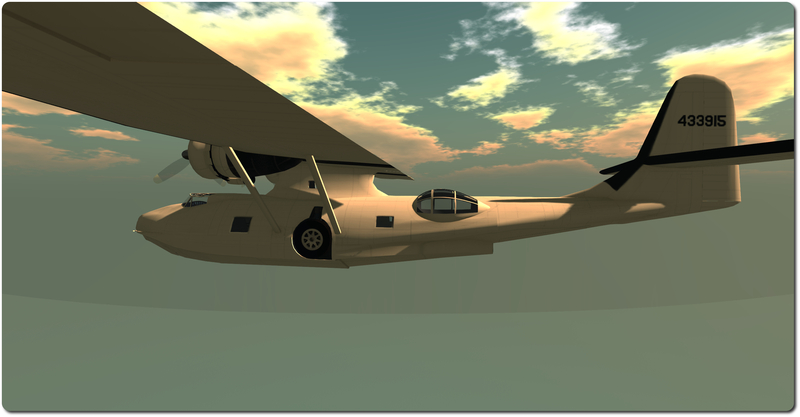 So when I was out investigating air racing locations in SL (of which, more anon) and I came across Shana Carpool’s PBY-6A (the “A” being for “amphibious”), I got completely sidetracked (sorry Terag! ), and couldn’t help but click the button labelled “PAY”. And I’m glad I did; this aircraft is simply beautiful. This is actually a new addition to the Shana’s impressive range of aeroplanes, and two variants are provided in the package: the flyable version, which weighs-in at a LI of 49 and a physics weight of around 9; and a static “display” model, which has a LI of 38 and roughly the same physics weight. 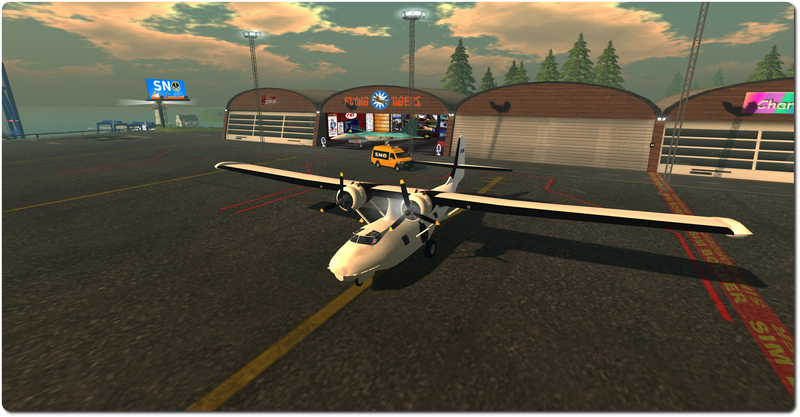 The scaling of the aircraft is idea for SL flying, and the dual controls make it fun to fly with a friend. 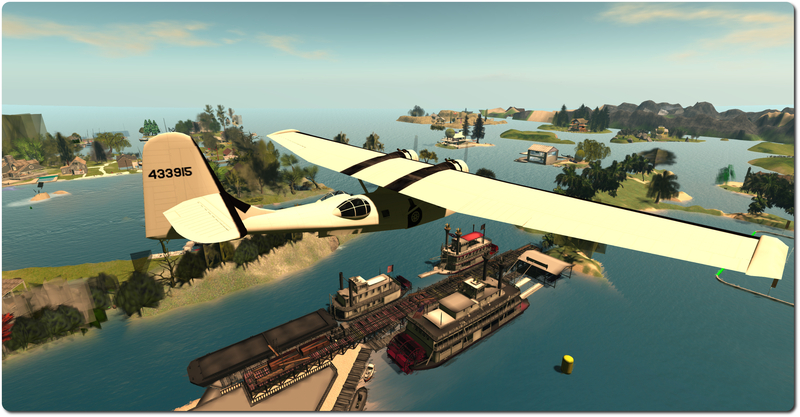 One of the great things about flying in SL is the chance to discover things – such as these glorious paddle steamers! 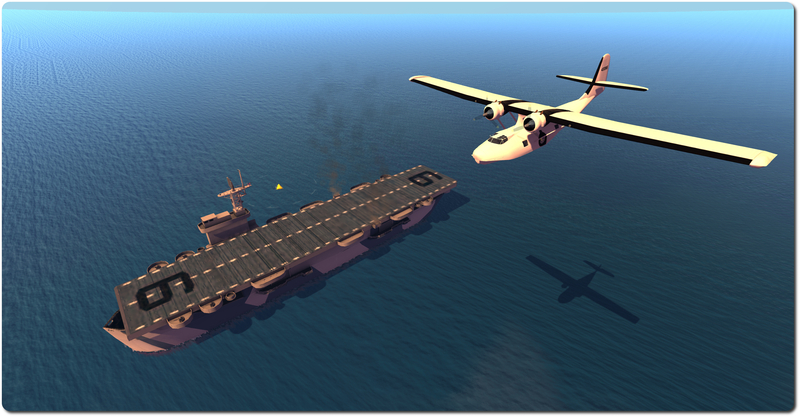 Being the amphibious version, the PBY-6A rezzes with wheels down, ready for a land-based take off. However, simply sit it in Linden water, get in, and with two quick commands you can lower the wing-tip floats raise the wheels, and be ready to take off from the sea. The controls are pretty typical, the usual WASD or arrow keys for up/down and left/right and PAGE UP and PAGE DOWN for the throttle. Other commands are single-letter commands – “g” for raising / lowering the wheels, “v” for lowering / raising the wing-tip floats, etc. In addition to this, the side “blister” canopies can be opened / closed at a click, as can the rear gangway. Starting the Cat causes the two engines to turn over in sequence; the big radials giving a puff of smoke as they cough into life. Both on land and water, the plane is very responsive to control movements, with ailerons, flaps and rudder responding nicely in response to input. With land based take-offs, the plane pretty much takes care of itself; simply get up to airspeed and it’ll lift itself off of the runway very smoothly, so with just a touch on the controls, you’re climbing out nicely, ready to bring the wheels up. On water it is slightly different – as it should be. Take-off requires a good head of speed and a firm (not too heavy!) pulling back on the yoke in order to get the water to agree to let you go. Landings are slightly harder. I’m not a qualified pilot in the physical world, nor am I an expert in dynamics; but I assume that huge overhead wing is responsible; once in the air, it doesn’t want to come back down to Earth, and I found myself drifting quite a distance down the runway before actually getting the wheels on the ground during my initial attempts. Whether the real Catalina is like this, I’ve no idea; but it felt very real, and certainly adds to the experience of flying the plane. As well as the exterior detail, the PBY6A has a nicely detailed cockpit, complete with the distinctive overhead throttles. The aircraft also comes with a painting kit, with three supplied finishes: white, dirty white and US Navy. UV maps and instructions are supplied for those wishing to create their own livery for the Cat, although I’m hoping we might see an extension pack (as my graphics design skills are non-existent!). I’d happily buy a pack offering RAF Coastal Command colours :). Given you can also deploy a “rescue boat” to help those in distress in the water, perhaps some form of coastguard colours in a pack wouldn’t go amiss (although I assume the boat is for combat pilots who have crashed into the sea). Region crossings with the PBY6A were no different from when flying my Spitfire or EC-135; the expected “”rubber banding” and / or barrel rolling as a result of the hand-off between regions was the same, and the occasional skewing of the camera to one side of the aircraft was encountered. Neither a fault of the design, just a fact of life with SL region crossings. However, given it can carry up to nine (2 crew + 7 passengers) I do wonder how things will fair on multiple region crossings under a full load. The camera slewing issue, when it occurs has led me to start flying more in Mouselook; it’s either that or edited the ‘plane mid-flight and quickly standing/sitting again to reset. I have to say that for some reason, I found doing so a lot more fun in the Catalina than in the Spitfire or EC-135. Perhaps this is simply because flying the Cat is new to me; but I certainly enjoyed myself attempting landings in ML a lot more! There are some lovely touches to this aeroplane; just witness the way the main wheels tuck themselves up into the fuselage recesses on being raised; similarly the lowering and raising of the wingtip floats is somehow poised and graceful. All told a fabulous aircraft, and one which really is a must for any SL aviation fan, and which also now has me thinking maybe I should be moving to somewhere larger, where I can park it on display :). Shana Carpool PBY6A Catalina price at the time of writing: L$2,100. Available from Shana Carpool headquarters and vendors across SL.